Manager for custom administrator menus at the Joomla backend. Tool to work with language files. 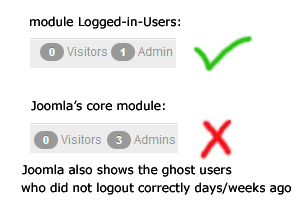 This administrator module displays the CORRECT number of logged in users. This administrator module shows the number of unread messages. With blink (optional). This is a demodemo text of the tooltip plugin. Plugin to display any module into an article. Plugin to display plugin code, without executing the code. The code is the exact same code as used in the above demo which displays the login module from the right column.